Just as the work done to protect the North Fork Valley has been a shared endeavor, the North Fork Scrapbook project is turning to the community to help this effort continue and to allow it to grow. The North Fork Valley of western Colorado is an incredible place that is cherished by many. It includes Colorado’s largest concentration of organic farms and orchards, ranches, dairies, and wineries; and is the state’s only rural federally-recognized winegrowing region. The valley is surrounded by public lands, which are managed by the U.S. Forest Service and the U.S. Bureau of Land Management (BLM), among other agencies. These lands are critical to the well-being of the present-day North Fork community, and include many important resources, like local water supplies, important wildlife habitat, popular hunting, fishing and recreation areas, and the highly scenic backdrop to the areas towns, wineries, and farms. These areas need to remain protected from harmful oil and gas drilling and fracking. The inspiration for the North Fork Scrapbook came about when the BLM first proposed leasing public lands in Colorado’s North Fork Valley for oil and gas drilling and fracking in December 2011. 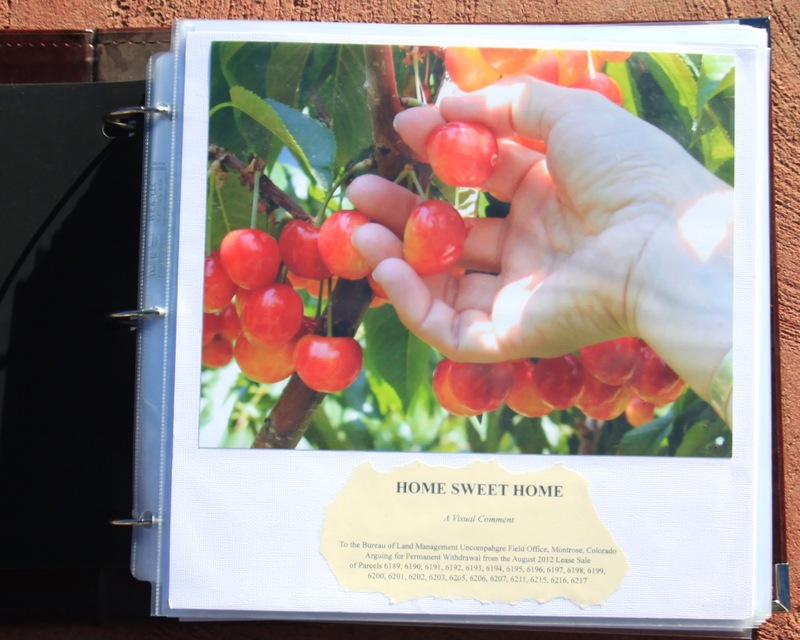 A real scrapbook was submitted to the BLM as a formal comment in a large three-ring binder, made up of stories and pictures from dozens of families. This ‘visual comment’ sought to dissuade the BLM from leasing these public lands through the stories and direct perspective of the people and communities that interact with them daily. Now reimagined in a digital magazine format, the North Fork Scrapbook serves as a living archive of the images, stories, and events that illustrate a community which finds meaning in the landscape. It seeks to capture the spirit of the unique composition of lands in the North Fork–the interwoven fabric of public and private lands, and the ingrained value of a shared landscape to the people and place. It is a dynamic history that supports resource protection for the future. Narrative is a powerful tool for collective action. Now once again the North Fork finds itself subject to threats from oil and gas drilling and fracking. The North Fork Scrapbook is a great way to spread awareness and share stories about this place. Your support will enable the Scrapbook to keep telling the story of Colorado’s exquisite North Fork Valley, and to help support the effort that will protect its beautiful landscapes, pristine waters, farms, homes, and vibrant, unique community. Citizens for a Healthy Community—which leads the community’s efforts to protect the area from irresponsible oil and gas development—kindly serves as the sponsor for this community-based project. Learn more about the North Fork Scrapbook and this amazing valley from community members at http://www.northforkscrapbook.org. Thank you very much for your support and generosity!